The group said it received positive responses from the federal government. The Kivalliq Inuit Association is pressing forward with its plans to bring renewable energy and broadband to the region. The KIA, which represents regions west of Hudson Bay, led a delegation of Inuit leaders to Ottawa earlier this week to promote the now-estimated $1.2-billion plan and look for the federal government’s support. Nunavut’s leaders have for years lobbied to extend Manitoba’s existing power grid north to communities along western Hudson Bay — the most recent feasibility study was completed in 2016. This revised project includes both hydro and broadband, which would begin in Gillam, Manitoba, and run north to five Kivalliq communities: Arviat, Whale Cove, Rankin Inlet, Chesterfield Inlet and Baker Lake, as well as Agnico Eagle Mines Ltd.’s two operating gold mines. 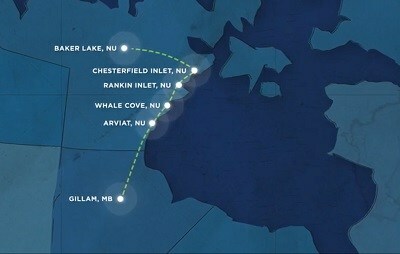 The KIA’s Kivalliq Hydro Fiber Link has since teamed up with private-sector development partner, Anbaric Development Partners, an American firm that specializes in large-scale electric transmission systems. KIA and Anbaric met with federal officials on Feb. 4 to promote the project, with the help of Nunavut premier Joe Savikataaq, Nunavut Tunngavik Inc. president Aluki Kotierk and Inuit Tapiriiit Kanatami president Natan Obed. “The project has received very positive responses from the federal government and KIA is continuing to work with them towards exploring the development opportunity,” the KIA said in an emailed statement. The Inuit organization has little else to say about any plans for the project; currently the KIA and Anbaric are renewing studies from past initiatives. They have pegged the cost of the hydro and fiber link at an estimated $1.2 billion, up from the estimated $904 million a feasibility study found it would cost to bring the hydro link alone. But the KIA says the proposed project would translate into $40 million in annual savings from diesel costs and lower the Qulliq Energy Corp.’s energy supply costs by half. The switch from diesel to hydro in those five Kivalliq communities and two mine sites could eliminate 380,000 metric tonnes of greenhouse gas emissions each year. And the provision of fiber optic could also make internet speeds 3,000 times faster, project proponents say.